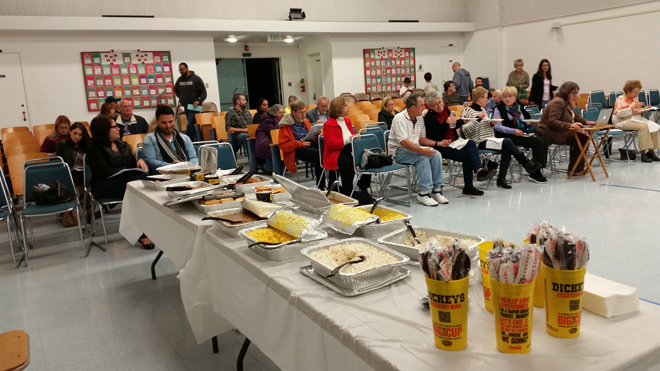 Fifty people attended the December 13 Northridge West Neighborhood Council (NWNC) meeting at Calahan Elementary School, which included a holiday spread from Dickie’s BBQ Pit arranged for by board-members Mikkie Loi and Colleen Pick. Speakers from SoCal Gas (Susan Trigueros and David Meza) and Porter Ranch Neighborhood Council President (Issam Najm) weighed in on whether or not NWNC should support a letter calling for the closure of the Aliso Canyon Gas Storage Fields. The gas company asked for the motion to be tabled to allow for further study. The NWNC Board voted down this amendment and instead voted to support the letter being sent to Governor Brown and other federal, state and local officials calling for the facility’s closure. Officer John Parker gave an update on crime statistics and how Devonshire Division compares with the rest of the other 21 police stations in Los Angeles. The good news is we weren’t at the bottom; the bad news is we weren’t at the top either. We were in the middle. In general, crime is up after several years of the rate going down. It was speculated that the passage of recent bills allowing for non-violent criminals to be released more quickly and the decriminalization of some statutes has exacerbated the problem. Part of the problem may be due to the proliferation of sober living and halfway houses that are becoming more common in the area. We have such a case going on now within 600 feet of Beckford Avenue School. Reportedly, this four-bedroom house has been stocked with 10 bunk beds to house 20 ex-convicts or recovering addicts. The home has not been occupied yet because of a challenge to the loan application. Hopefully this home will never be occupied as a halfway house/sober living facility, but we cannot rely on technicalities to halt their opening. With that in mind, the board approved a letter to Congressmen Brad Sherman asking him to intervene if HUD drags their heels in taking action on the community’s allegations of fraud regarding the loan documents. The Public Safety Committee hopes to have a meeting in late January or February with state and local governmental officials, the police department, and the city attorney to look at this specific case, as well as short- and long-range solutions to a difficult and complex problem. President Peter Lasky announced that the Urban Forestry Division has approved the plans submitted by NWNC for the installation of a drip system to save the trees along the Tampa Median. Urban Forestry is working with a new contractor for the installation of city agreed-on improvements and will hopefully allow the new backflow devices, solar timers and meters to be installed soon. 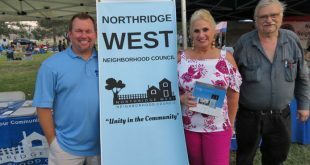 The Northridge West Neighborhood Council was on hand to greet people at the National Night Out Against Crime Celebration at Northridge Park on Tuesday, August 7. It was a great evening of fun with hot dogs, face painting, a screening of the movie Ferdinand and more.